Residents are frustrated after waiting more than two and half years for a new fire station. KANSAS CITY, Kans. — More than two years ago, Unified Government commissioners signed off on a new fire station for the Piper community. Now residents, a union leader and even a county commissioner are questioning why shovels haven't gone into the ground yet. They made their opinions known Monday night during a heated and packed open house during which an architect presented designs for a fire station at the intersection of Hutton and Leavenworth roads. The $4 million project will include three bays for fire rigs, plus a decontamination zone with positive air pressure to limit exposure to cancerous toxins. Those who attended the meeting had no problem with the design; rather, the project timeline raised questions. The Unified Government Commission approved funding for the station in July 2016. According to the architect who presented on Monday, construction will begin at the end of this year. The fire station is expected to be completed by the end of 2019. "Where is the problem with getting this thing done?" asked Robert Wing, Business Manager for IAFF Local 64, the union that represents KCK firefighters. 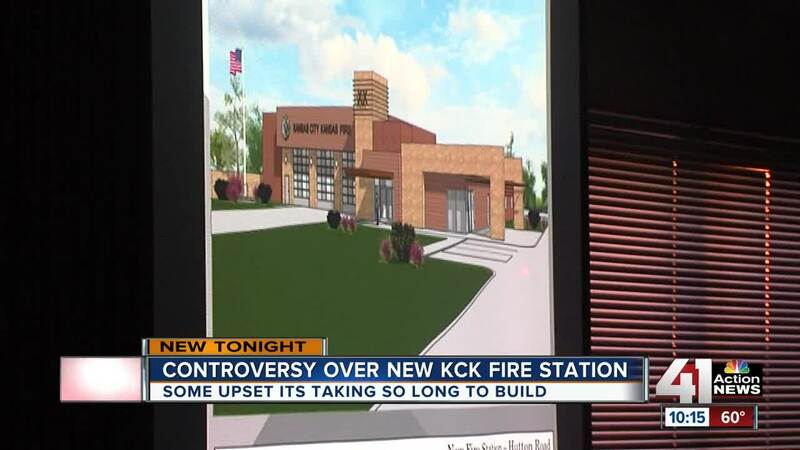 Wing also raised concerns about a statement made by KCKFD Chief Michael Callahan, who said the new station would be staffed by moving firefighters already in the department. "It is unacceptable to me that it was relayed tonight that a fire company is going to move from in town out here. That is going to just cause the problem that exists out here downtown," Wing said. His questions led to an impassioned speech from Unified Government Commissioner Mike Kane, who said the city has been dragging its feet on the project. "We need that fire station. You guys gotta figure out a way to build it faster than what you're gonna do. You can work overtime. You can work 'round the clock," he said. Unified Government staff explained the time frame was a result of looking at different sites and going through the land acquisition process. KCKFD Chief Michael Callahan, who signed on with the department in August, said from his experience, the timeline is typical. He came from the Chicago Fire Department, where he was in charge of building new firehouses. Callahan said the process usually took up to four years. "I know the people here are frustrated because they've been promised this for a very long time. It is being done, and we're doing our best to move with as much dispatch as we can while doing it prudently as well. You don't want to move so fast that you cut a corner that later comes back to haunt you," he said. According to Kane and Wing, the Piper community was promised a new fire station when it was annexed by the county 25 years ago. It is currently served by Fire Station 8, a structure that was built in 1979 as a volunteer fire station. According to a 2015 study commissioned by the city, that station is not in compliance with any codes or the NFPA. The study recommended construction of two new fire stations in the Piper area. The Unified Government plans to either remodel or replace almost half of its fire stations in the next ten years because of the study.